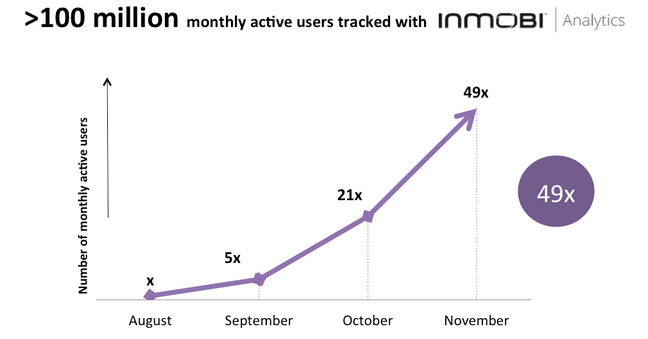 Over 100 million users being tracked via InMobi Analytics! Creating an innovative product is just not enough. Does it drive enough value to its users? Is the product better than its competition? Is it easy enough to integrate into one’s app? Do users get a free rein on experimenting with the product while adopting it? A product’s adoption hinges on the answers to some of these crucial questions, which InMobi Analytics has undoubtedly addressed. We are happy to report that InMobi Analytics is seeing stellar adoption over the past few months and striking the right chords with the global developer community. 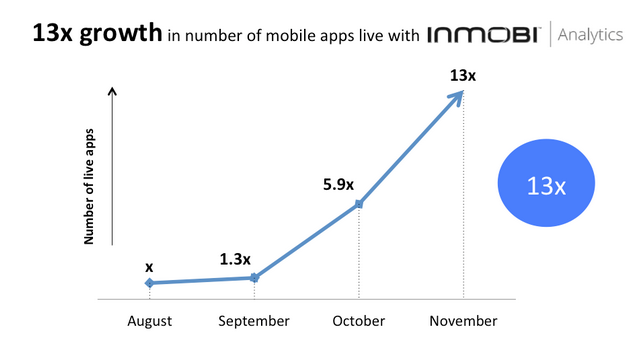 Over the last few months, the number of mobile apps leveraging the power of InMobi Analytics has skyrocketed. Since August 2013, 13 times more apps have integrated and are live on InMobi Analytics, with this number still growing exponentially. 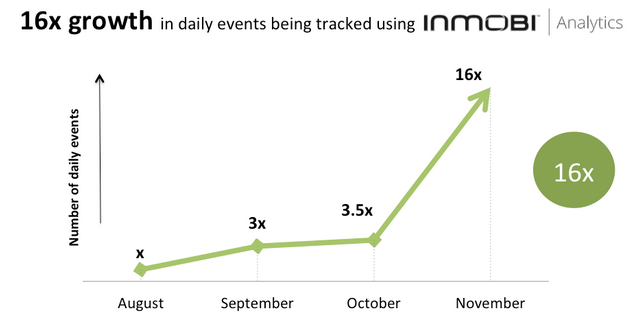 Tracking events is crucial for app developers who are looking to experience the true potential of InMobi Analytics. By understanding how their users interact with apps, app developers can derive insights and take meaningful actions on them. Let’s take the example of a casual game such as Candy Crush Saga, where the levels get progressively tougher. Sometimes, if a level is too difficult to cross, a gamer may stop playing altogether. InMobi Analytics can be effortlessly used to find the users who are stuck and who are on the verge of dropping off. Such users can be targeted with unique power-ups or level-ups in order to help them progress in the game, thereby preventing any drop-offs and maximizing their lifetime value. With InMobi Analytics, you can track all important events such as social network shares, level progressions, power ups being used, etc, or set up and track custom events unique to your game. Chart (ii) shows a 16-fold growth in the daily number of events being tracked from August to November 2013. With some of the biggest developers on board, this metric is in the tune of hundreds of millions of events PER DAY! And it doesn’t end here. As seen above, we are now tracking over 100 million mobile users with InMobi Analytics. Their in-app behavior, purchase behavior, demographics and engagement levels are some of metrics being captured. Chart (iii) shows the soaring growth witnessed on our network. High-quality users @ scale: App developers using InMobi Analytics to track campaigns across ad networks, are even able to attribute the quality of users to a specific ad network. The added ability of tracking user quality allows the InMobi Network to intelligently optimize campaigns by focussing on acquiring similar best users at scale. InMobi Analytics does not just guarantee increased conversion rates. It guarantees the acquisition of best users. With continuous learning through InMobi Analytics, app developers focussing their advertising spend on acquiring more high quality users are already seeing remarkably better results - with the best yet to come! Maximum Monetization: Each user is unique and when it comes to monetization, they need to be treated as such. InMobi Analytics gives app developers just the right set of tools to maximize the lifetime value of their user base. Segmenting users based on purchase history, engagement levels, demographics or any custom event unlocks a whole new world of revenue optimization. The “House Actions” feature allows app developers to target these segments of users with advertising, online or offline promotions, promotions of other in-portfolio apps and more, thereby guaranteeing an uplift in overall revenue. Is your app integrated with InMobi Analytics yet? Learn more by visiting http://www.inmobi.com/products/analytics. Visit the SDK download center to download InMobi unified SDK and get started today! For any further queries, please drop a line to developer@inmobi.com and we will get back to you within 24 hours.